RegenePure Precision uses 5% minoxidil as its active ingredient. One of the most widely used treatments for hair loss, minoxidil is a FDA-approved topical medication that is available without a prescription in its 5% strength. Our formula contains the highest grade of minoxidil to offer the best possible results in the fight against male pattern baldness. Male pattern baldness is caused by the scalp’s sensitivity to hormone called dihydrotestosterone or DHT. This sensitivity causes the hair follicles to decrease in size, which pinches off developing hairs and makes them thinner. Hairs that emerge from the narrow follicles also fall out more quickly due to the reduced size of the follicle opening. Minoxidil 5% is known to extend the development period of new hairs, making them thicker and stronger. The drug has also been shown to stimulate hair growth, helping new hairs develop in areas where the follicles have become dormant due to the effects of DHT. 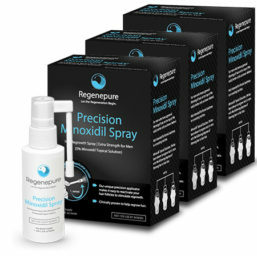 RegenePure Precision is the only 5% minoxidil formula on the market to use our unique fine mist spray applicator. For minoxidil 5% to have any effect upon hair development and growth, it must reach the hair follicles. The RegenePure Precision fine mist applicator spray delivers the formula directly to the scalp, ensuring that the over-the-counter medication reaches the follicles. This differs from foam applications, which are applied to the hair and then must seep downward to the scalp. With foam minoxidil products, only some of the formula reaches the follicles, while the rest becomes absorbed by the hair or wiped away following application. Minoxidil formulas in dropper forms are imprecise; it’s difficult to monitor how much of the formula has been applied to your skin and to ensure that the entire scalp has been treated. The RegenePure Precision fine mist spray covers a wider area than what is possible with dropper formulations, preventing uneven application and ensuring that the formula reaches all of the hair follicles. The mist is also much neater than messy dropper products. The fine mist spray application method makes RegenePure Precision a more reliable way to give the scalp the benefits of 5% minoxidil.